Please read the following "disclaimer". Then, click on the button below. 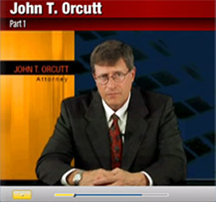 This website was created by Attorney John Orcutt to try to "breathe life" into the dry, but nonetheless important, bankruptcy laws. Nothing herein is intended to guarantee specific results. Bankruptcy may not be a solution for everyone. Each case must be evaluated separately based upon an individual's assets, debts, and goals. The materials on this website are for informational purposes only and do not constitute legal advice, nor are they intended as a substitute for a complete assessment of your particular situation by an experienced bankruptcy attorney. Our goal is to illustrate how filing bankruptcy can, under the appropriate circumstances, improve a person's financial situation and, hopefully, the day-to-day quality of life. No Need To Wait Make Your Appointment Now!